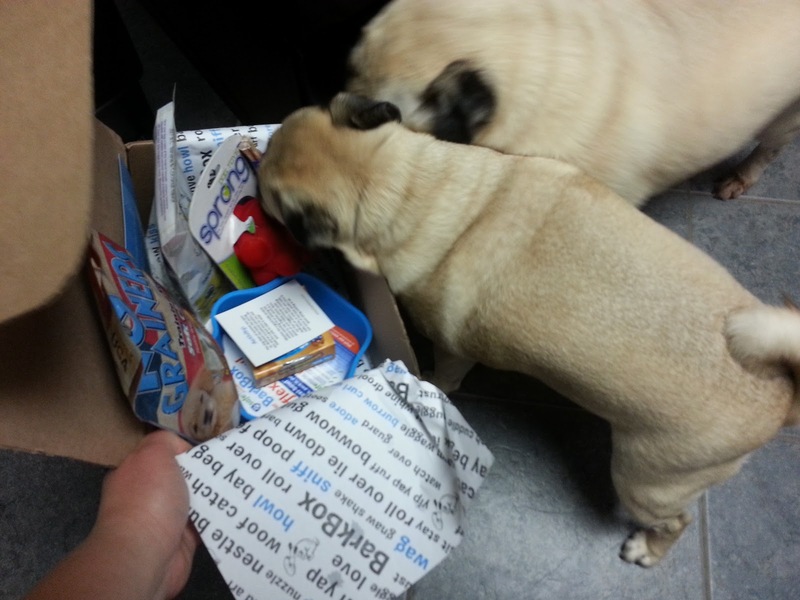 I have not been having a great week, but the girls are having a fabulous one because today their July 2013 BarkBox arrived! This was probably one of my favorite boxes so far because there was such a great variety of surprises and the box was filled with awesome things! I thought last month's box had a lot of interesting and unusual items, but we didn't really use the calm wafers and I still haven't given them the doggy beer or bones yet. So let's start going through this month's box, shall we? R2P Pet's Sprong - this toy has a great squishy material, velvety texture, and a squeaker inside. It has some great bounce and it's so lightweight I bet it would be a great toy to use in the water. 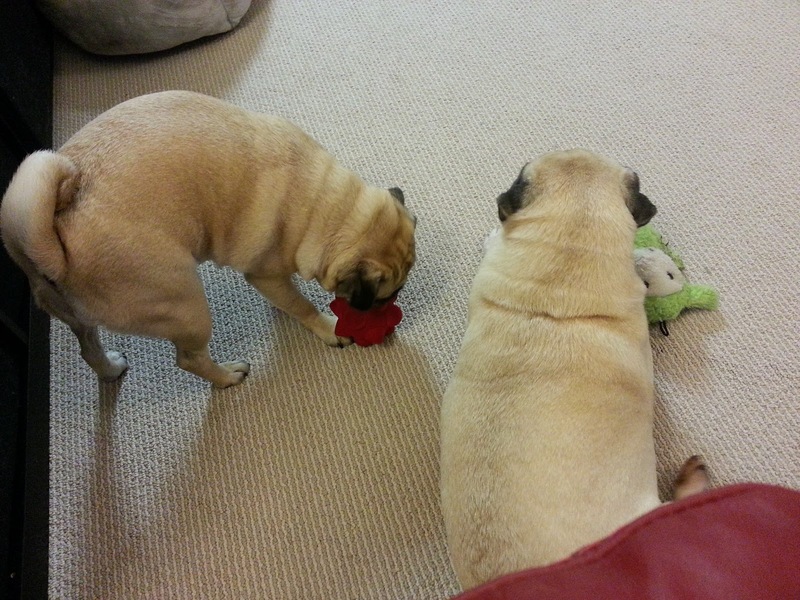 Because the girls are too excited about the treats in the BarkBox, they haven't really played with this toy yet but Sunny was a bit intrigued so we'll try playing with it soon. 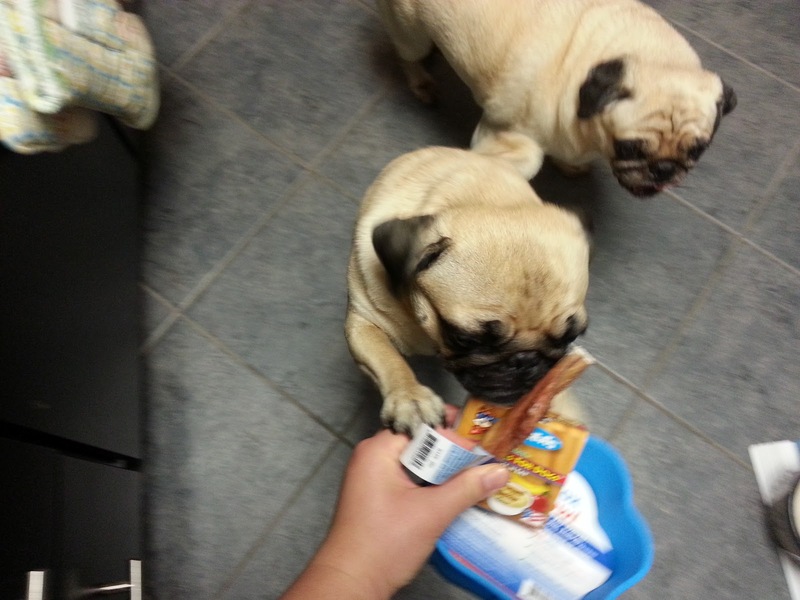 Barkworthies bully stick - I love that BarkBox often includes a bully stick in the box and the girls love it as well! Rosy kept trying to sneak away with it while I was taking photos of them with the box. 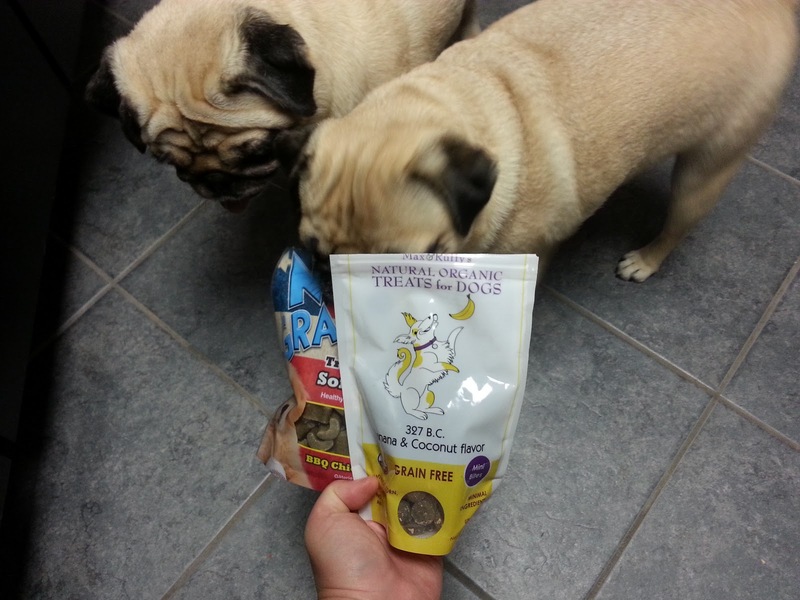 Max & Ruffy's natural organic grain-free treats (banana and coconut flavor) - I am loving that BarkBox has been including so many grain-free treats in their boxes lately! 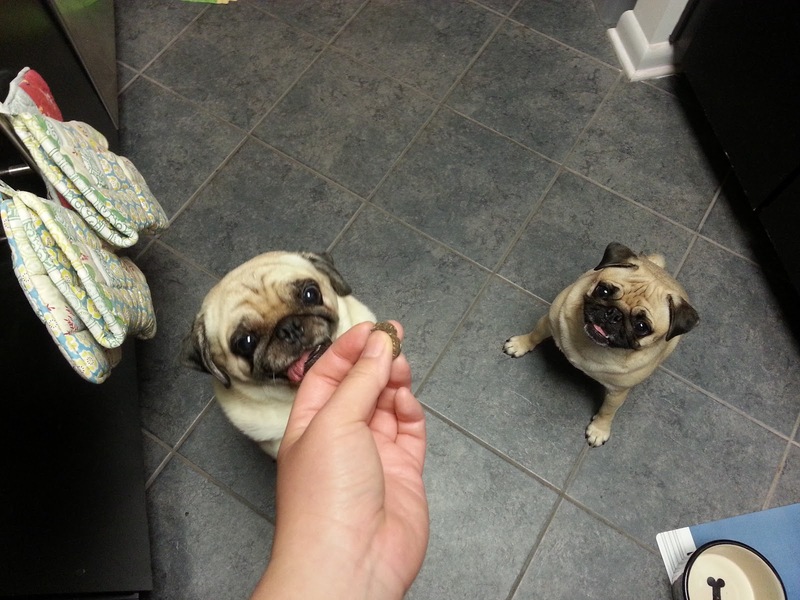 These are interesting treats but Rosy didn't love it as much as Sunny. She ate it eventually but I think the flavor wasn't her favorite. Sunny happily gobbled hers up though! I checked online and they have a bunch of different flavors so I may try some of their other flavors. 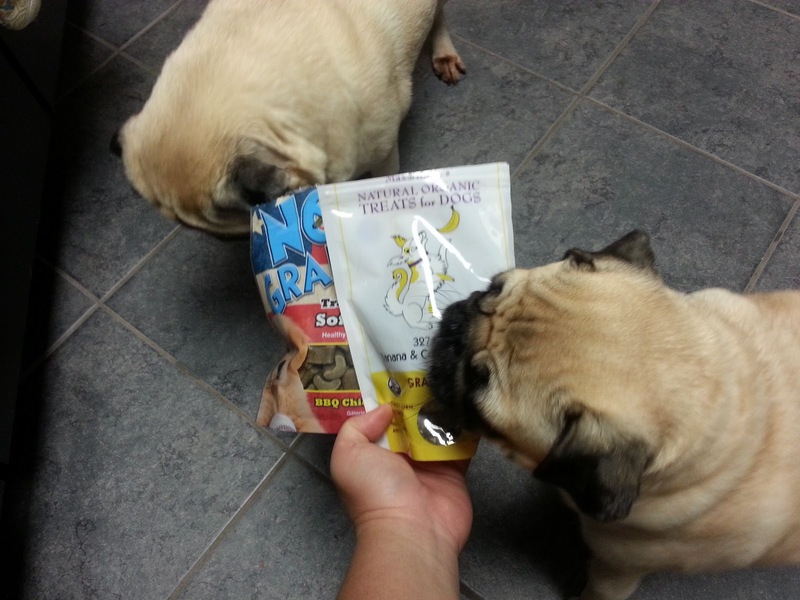 No Grainers (bbq chicken flavor) - another grain-free treat yippee! These are also wheat, corn, and soy free and are made in the U.S. The girls LOVED these treats! I liked the "U" shape of these treats because it was easy to snap them in half to give the girls a tiny treat. Sunny couldn't stop dancing for these treats so I think these were the clear favorite of this month's box! Mr. Barksmith's cool treats smoothies - I think I got this in a box a while back but I never gave it to the girls since I wasn't sure how I'd divide it but now that I have two and it's been brutally hot and humid here, I'm definitely going to give this to the girls as a treat soon! Safemade flexi-bowl - This is a child-friendly food-grade silicone flexilble dish that is perfect for traveling with. It's also freezer, dishwasher, and even oven safe! 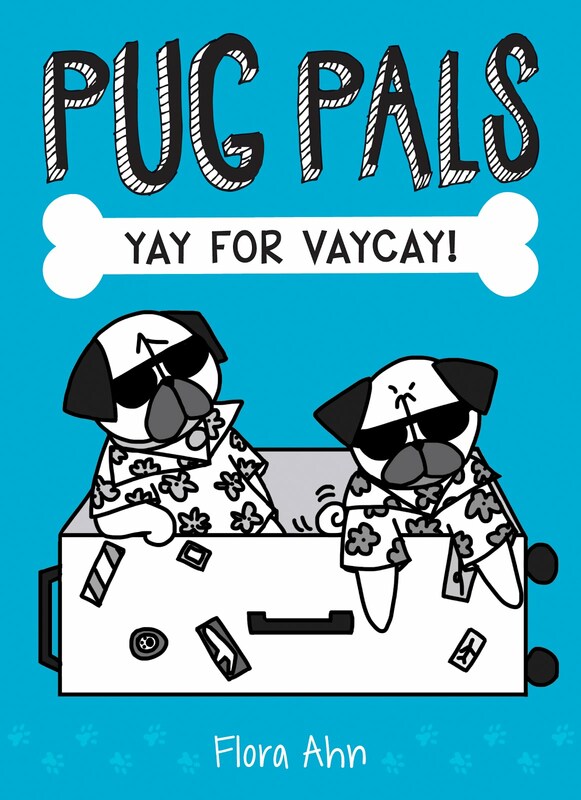 BarkBox included in the description card a helpful hint that you can freeze water in this bowl overnight for maximum coolness at the park or other outdoor adventure! I don't have a travel bowl so I'm really glad to have this because this will come in handy a lot. See, wasn't this month's box awesome?! Ok, enough talk. Let's just go to the pictures now. 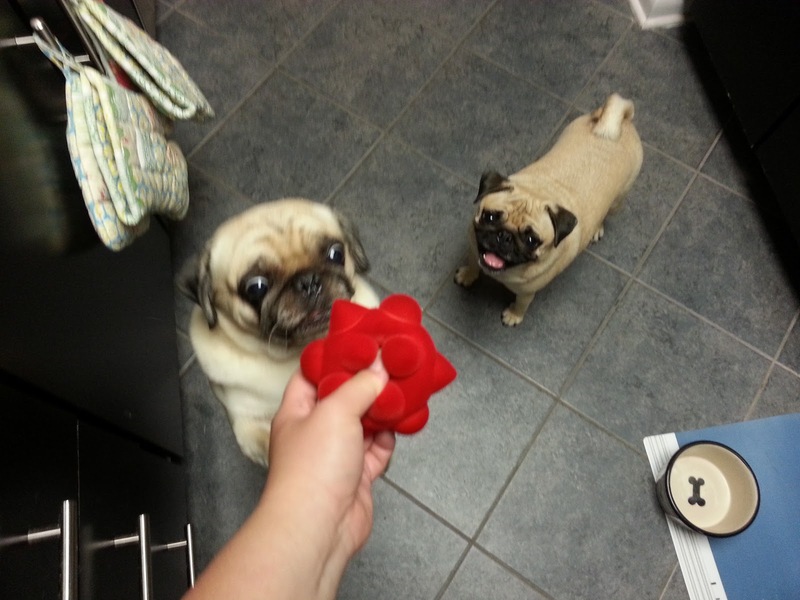 Look at how much Sunny and Rosy loved this month's Barkbox! As soon as I started opening up the box, the girls creeped closer and closer. They knew there were good things inside! 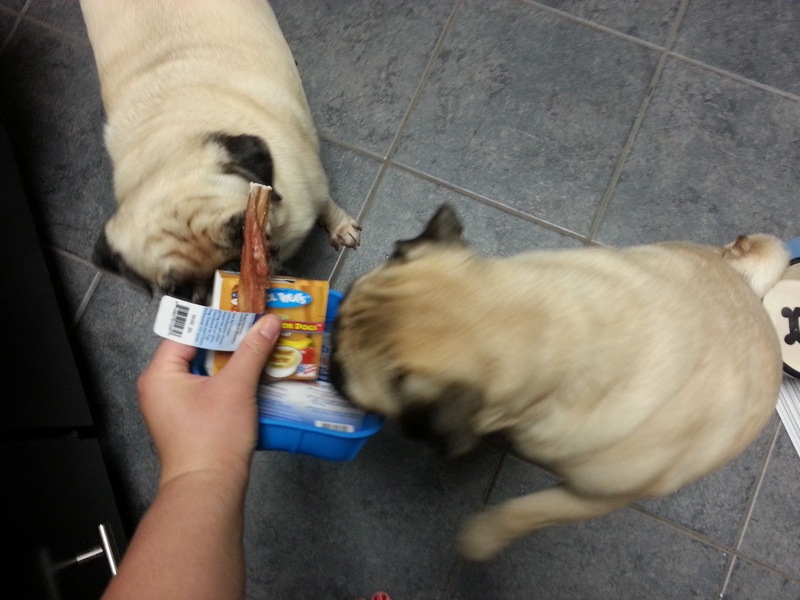 Of course Rosy went straight for the bully stick! 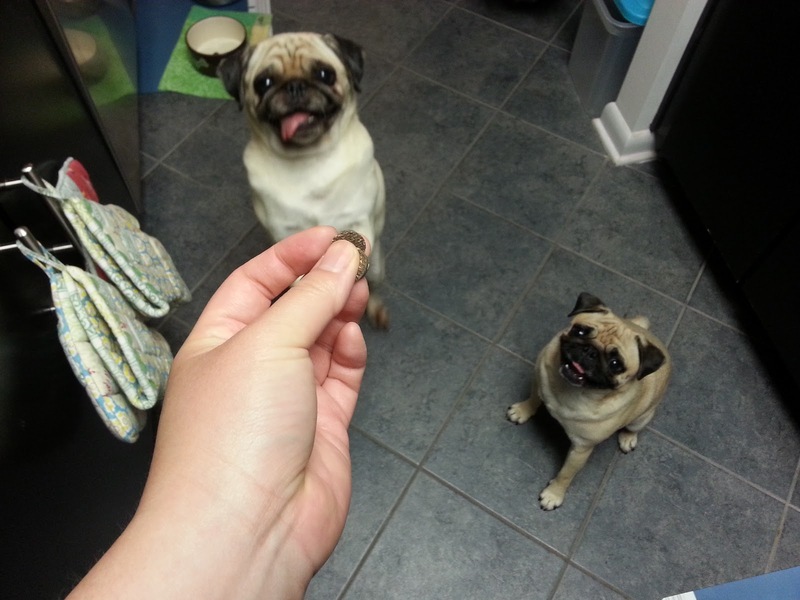 But soon the girls got distracted by the treats. I don't know if they could smell the treats through the bags or they just assume these are dog treats because they're in a dog treat-like bag, but they were fixated on these bags. 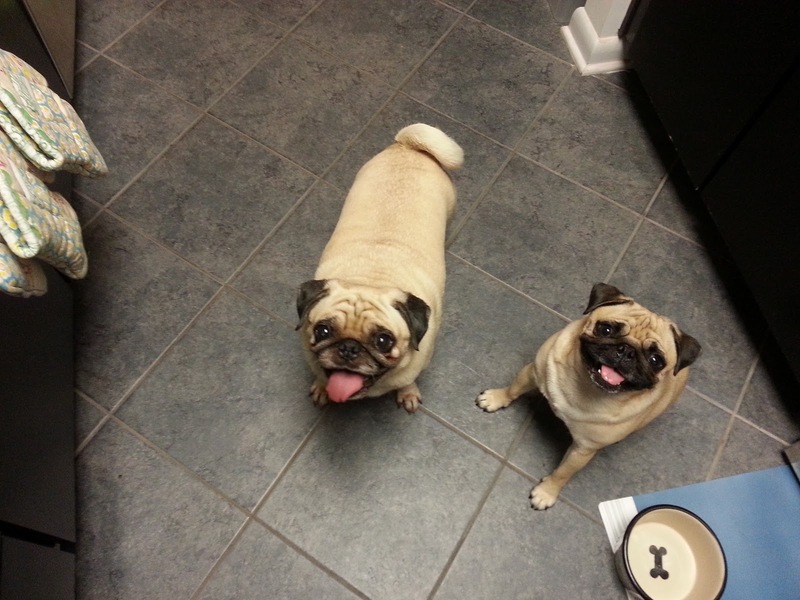 Ok, ok, enough teasing you girls, time to break out the treats. Look at their goofy entranced faces! Dance for me my pretties! Dance if you want these delicious treats! I'm not using the bully stick, smoothies, or flexi dish yet so I just held them all together for some photos. And there goes Rosy after the bully stick again! 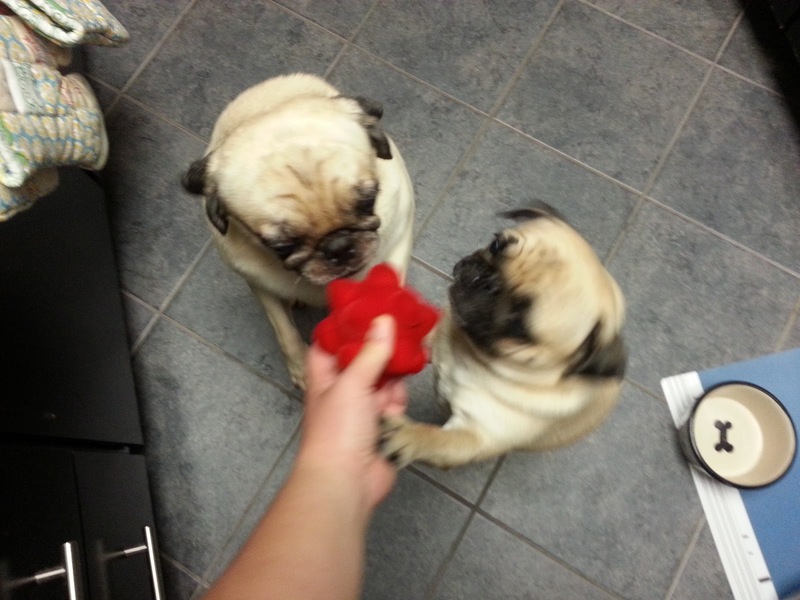 The girls were intrigued by the toy but once they realized it wasn't edible they lost interest for now. 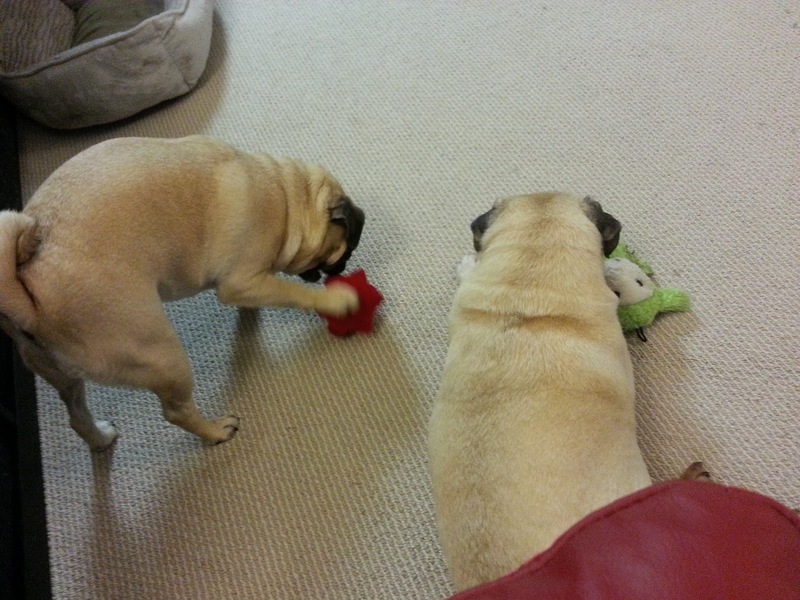 But later in the evening I saw Rosy playing with it again. Look how happy the BarkBox makes the girls! 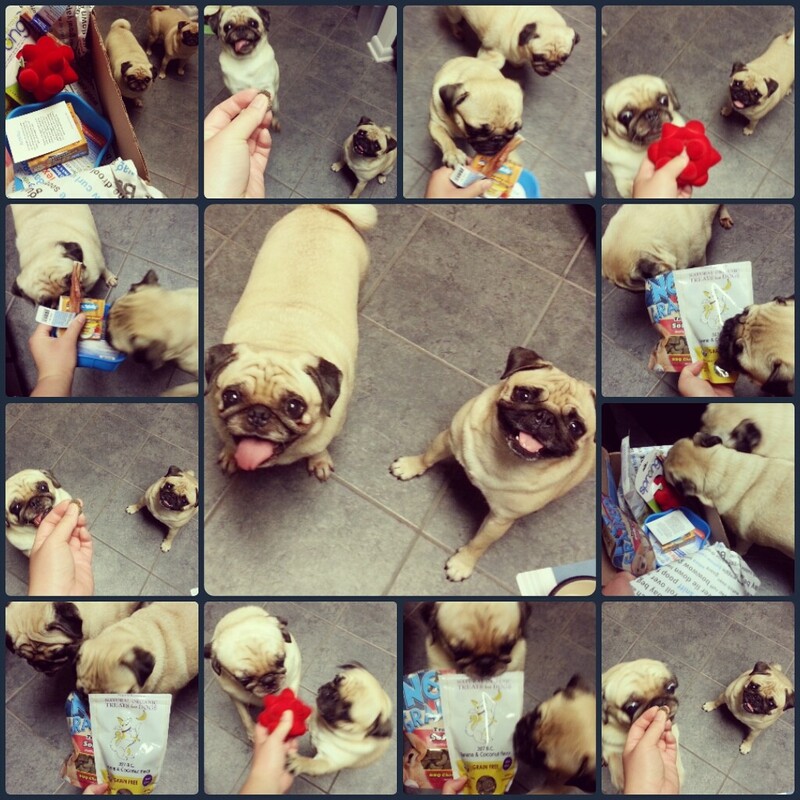 So to sum up, here's a collage of the July 2013 BarkBox experience for Sunny and Rosy! 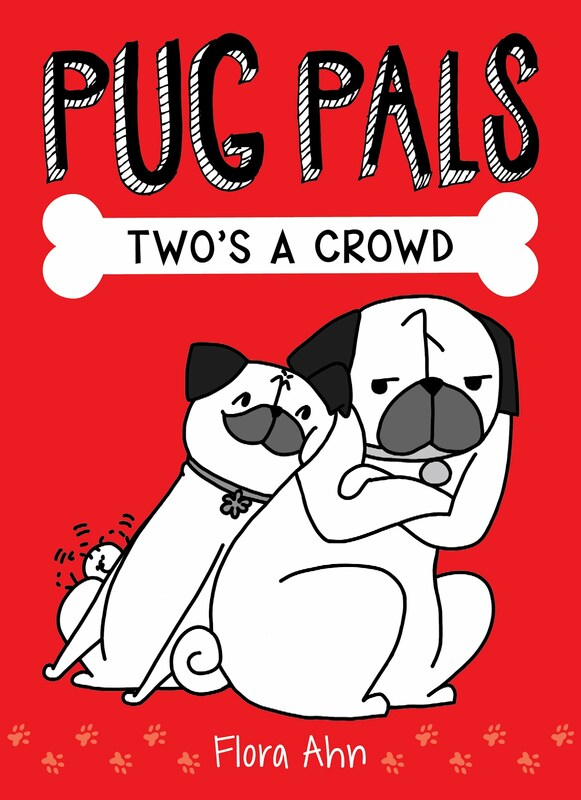 If you're interested in one for your dog(s) check it out at BarkBox's website. 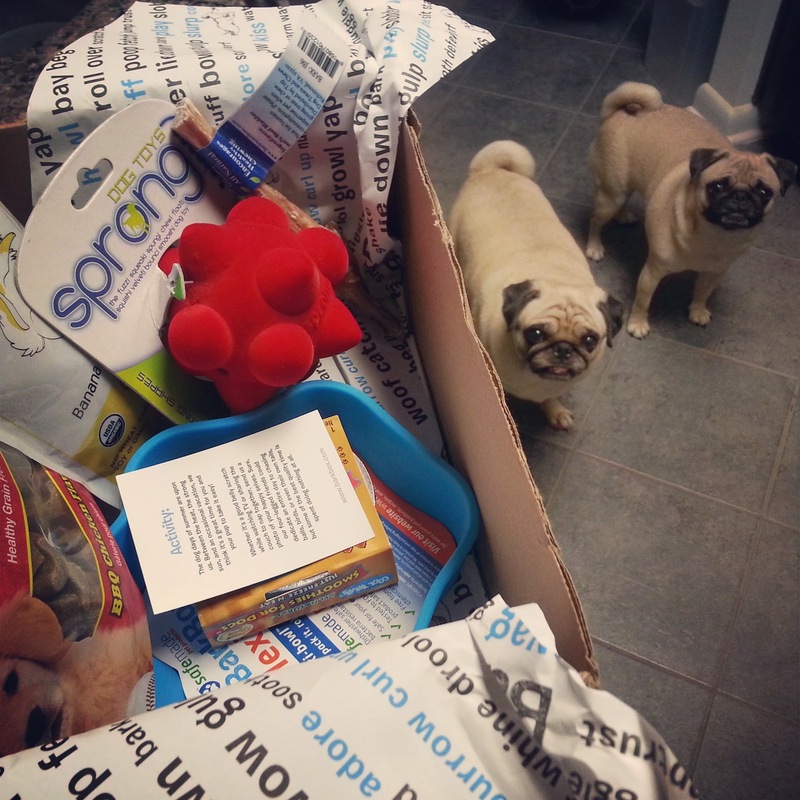 We get the small box although lots of pug owners get the medium box instead. WOW ... that is pawsome! We're gonna have to get signed up so we can get our own Barkbox. I feel like the internet needs more pictures of the top of pugs' heads. 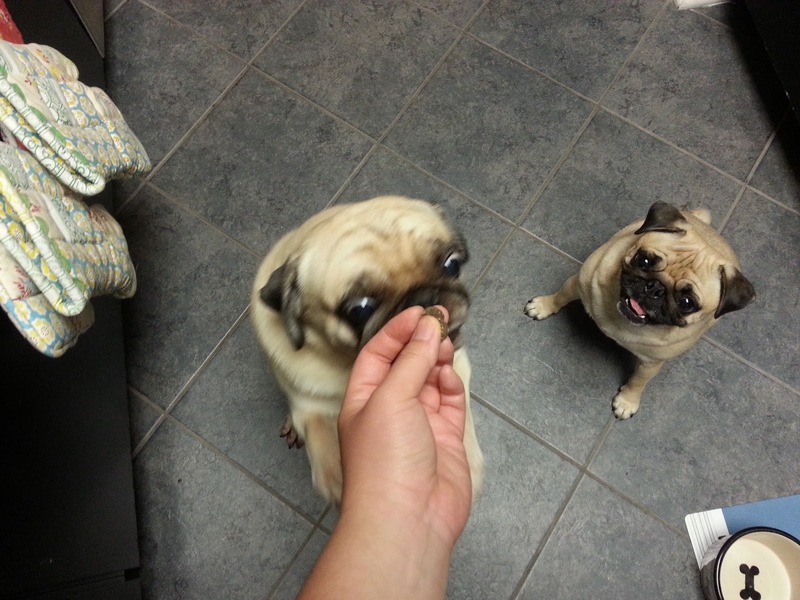 Rosy's looks so soft and squishy and pettable!